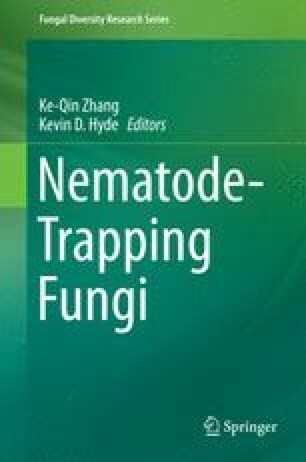 Nematode-trapping fungi of Orbiliaceae include those filamentous species forming trapping devices to prey on juveniles of nematodes. In this chapter, the taxonomic history of predatory orbiliaceous fungi is reviewed and the system of using trapping devices as the primary morphological criterion for generic delimitation is advocated. Following this taxonomic concept, keys for genera of Arthrobotrys, Drechslerella and Dactylellina, which include all reported species of predatory orbiliaceous fungi are presented. Totally, 54, 14 and 28 species from Arthrobotrys, Drechslerella and Dactylellina respectively, are morphologically described and illustrated. Known asexual-sexual connections (14) of predatory orbiliaceous fungi are summarized and their taxonomic descriptions and illustrations presented.